Bengal cat breed information, Bengal cat advice. Colours brown spotted, brown marble and snow spotted Bengals can be shown at championship status with the Governing Council of the Cat Fancy (GCCF). Bengal cat breed information. A domestic cat in wild wrapping. The Bengal cat is one of a kind! Any Bengal owner will agree that, whether you're drawn by their beautiful coat or tempted by their cheeky sense of humour, you'll certainly have your work cut out for you if you welcome one of these mini leopards into your home. "I always tell people they are the ones on Duracell batteries!" laughs Barrie Alger-Street, chairman of the Bengal Cat Club. "They're full of energy and they want to do things most of the time. They won't curl into a ball and just lay there. They're highly intelligent and very active. They can be a bit boisterous, which might be a bit much for some owners." The striking appearance of the Bengal is often responsible for the common misconceptions about this beautiful breed's behaviour. Although their wild looks lend a certain exotic impression, Bengals are by no means aggressive, despite their intense personalities. "Bengals don't prey on wildlife," asserts Barrie. "Even with their history and where they've come from, they're not mass killers. Bengals are generally not good hunters; they're more likely to just watch." Sue Moreland, GCCF veterinary officer, has been breeding Bengals for 15 years. She agrees: "Their temperament is even better than it was when I started breeding." You're likely to have heard of the breed's well-known love of water, and for most Bengals this is true. Owners are advised to take precautions to protect their curious kitties from riskier sources - simple things like making sure toilet lids are down will ensure Bengals can't ingest any dangerous chemicals - but don't be surprised to find them drinking from the tap or joining you in the shower! Bengals are incredibly loyal and loving too. "They do love their humans, much to their owners' exasperation!" laughs Barrie. "From the moment a Bengal accepts you, you can't be trusted to do anything without being supervised! They are very 'helpful' around the house, and they will steal trinkets - you'll often find a stash of goodies, like pens and pencils, lying about." Sue says: "They will play with you if you let them; they're very clever. They don't suffer fools at all and are such a lively breed. They're very vocal as well and have a wonderful range of sounds. They'll make different noises and be very chatty to let you know what they want. They won't keep quiet if they're unhappy either - they will grumble to warn you." Although Bengals have frequent 'funny five minutes', they're very adaptable and can adjust to daily routines, as long as they are kept occupied and entertained. Barrie warns: "If a Bengal is left on his own, he will do one of two things: either amuse himself by causing chaos or escape to find someone to play with. If you'll be out all day, it's best to have two to keep each other company. Sue adds: "They're good with dogs too and some even prefer the company of dogs to other cats! Bengals can be a bit territorial so they might not suit big multi-cat households. It's not that they're anti-social, but they do like be your number one." The Asian Leopard Cat was bred with the domestic cat (starting with Abyssinians, Burmese and Egyptian Maus) in the 1980s by paediatrician Dr Willard Centerwall, who was attempting to transfer the leopard's immunity to feline leukaemia to its tamer cousin. Unfortunately, the resistance didn't pass on to the first generation. Most of the offspring were taken on by Jean Mill, who continued to breed them until - after overcoming a number of obstacles - the breed was recognised by The International Cat Association (TICA) in 1983. The breed's development is also said to have been an attempt to stop people buying wild cats as pets, and to dissuade them from wearing fur. Bengals were first imported to the UK in 1991 and were recognised by the GCCF six years later. They achieved full Championship status in 2005. The Bengal cat is a 'wild' looking domestic cat. The standard calls for a large, sleek, very muscular cat with hindquarters that are slightly higher than the shoulders, and a thick tail that is carried low. The Bengal cat's head is rounded and slightly longer than it is wide. The nose is broad and the muzzle full, with a light coloured, strong rounded chin and pronounced whisker pads created by wide-set canine teeth. The ears are medium to small with rounded tips pointing forward in profile. Bengal cats are said to be loyal, loving and will quickly become part of your family, mixing well with children and other animals. Some of the Bengal cat's wild instincts have been retained, including a love of water, so owners are advised to keep toilet seats closed and expect to see their Bengal cats drinking from a tap. Other traits include intelligence; Bengal cats are said to be adaptable and sociable, and they can often be talkative. When buying a Bengal kitten, you should look for a bright-eyed, playful kitten from a recognised breeder. Try to see the litter with their parents as well. Sue says that if the kittens have been socialised properly, they should be outgoing and willing to be handled all over. Be wary of kittens that hide from you if they are past seven weeks old. You should expect to part with at least £450 for a pet-quality kitten. There are plenty of breeders across the UK, so you shouldn't have too much trouble finding one in your area, but kittens do tend to be seasonal. 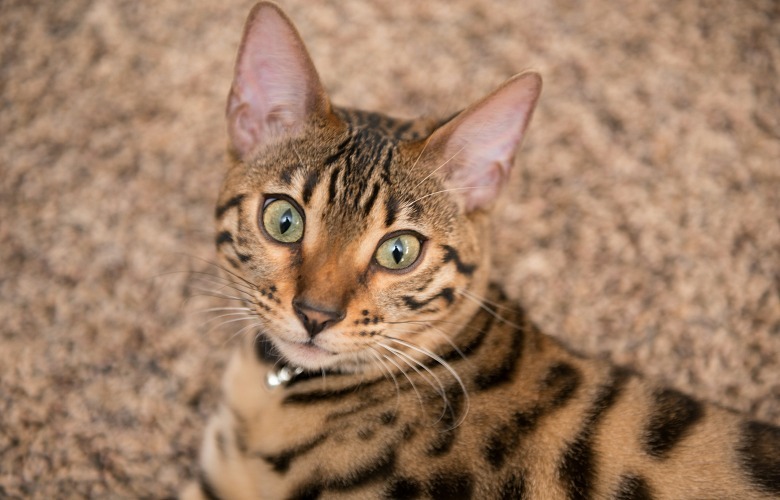 Bengal Cat Club has a popular and active welfare page, managed by Tracy Wilkinson. The organisation is keen to remind potential owners that, instead of buying a kitten, there are always much loved adult Bengals who sadly need new homes. Bengal cats don't like to be left alone for long so if you're going to be out at work all day it's best to get two so they will keep themselves amused. The challenge is keeping up with their energy levels and intelligence. Bengals are generally healthy and quite robust. Barrie says: "Their health is quite stable now that they have moved away from earlier generations and there are no inherited diseases specific to the breed." Reputable breeders will make sure they conduct DNA tests, as with all breeds, to ensure that their cats are not carriers of any diseases. Due to their shorter coats, Bengals don't have a particularly intensive grooming regime, and most owners find that a weekly brush is enough to get rid of loose hairs and keep the coat beautifully lustrous. "I first remember reading about Bengal cats in the 1990s, and fell in love with them straightaway," explains Di Cheal. "We weren't in a position to welcome one into the family at that time, but they remained in the back of my mind. "In 2011, the lure of the Bengal re-emerged, so I undertook detailed research into the breed and into reputable breeders. I made a shortlist of breeders, including Sue Moreland from Tobysden Bengals, who it was soon clear was the breeder for me. We visited Sue's house as she had two available kittens. We were looking for only one cat, as we had three moggies, but couldn't decide between the two so - yes! Both Spot (brown spotted) and Lula (blue-eyed snow spotted) came to live with us a few weeks later. "In 2014, we decided that our home would be complete with just one more Bengal. We'd become good friends with Sue so we knew when she had kittens available and, sure enough, ended up with two new babies, Spike (pictured) and Annie (both brown rosette), who are half-siblings to Spot and Lula as they share the same father. After careful introductions, all our Bengals get on great with each other and with our moggies, apart from the odd disagreement now and again, as you might expect. "Bengals are quite different in personality to all the moggies we've had. They're inquisitive - they think nothing of jumping on you, the worktop or wherever they like to see what's going on. They're vocal and will let you know when they want something, or when the service they're receiving from their humans isn't up to standard! They're agile but can be clumsy at the same time. They'll leap after a fly or a toy with no thought of where they're going to land - or what they'll knock over in the process. They're very active and love water. Thankfully, ours have a large, secure cat garden filled with grasses, climbing frames and small trees for them to burn off that Bengal energy. "Bengals love heights - they want to peer down on all the comings and goings around them. So we have cushions on the top of our kitchen units and bookshelves - they may as well be comfy whilst they're up there! They're also very naughty. We don't have houseplants as they get knocked over or destroyed, and all four of them have a strong desire to go up our chimney! "My advice to anyone considering getting a Bengal is to research registered breeders to ensure you get a healthy, well-socialised kitten. It may cost a little more, but it's most definitely worth it. Make sure you've researched the breed as the Bengal is not a laid-back lap cat! You need to have lots of time to amuse them with toys and activities. When Bengals get bored, they can become destructive. You need to invest a bit more effort into owning a Bengal? Is it worth it? Absolutely!"